How To: Hat & Scarf by Johnny D.
I knew that Mr. Hat Man himself, Johnny would have a thing or two to say about wearing a scarf and fedora together. Like, "be casual baby…but not too casual." " A little bit of French je ne sais quois, with with a bit of pirate crazy throw in to keep 'em guessing where you're hidin' yer treasure…wink wink." "Let the scarf do all the talkin' for you, like my x-wife Vanessa used to do for me in France." "Wear bracelets…lots and lots of bracelets. They remind me of who I am, where I am going and I have one that says, "I live at …." in case I am too inebriated to make it home on my own. Somehow a nice gal finds me and is always willing to take me home." "When the paparazzi catch you…simply hide behind your hat. If that doesn't work move to France and live in a castle. That worked for me for years." What, what did he say? I can’t concentrate when Johnnycake is around. I’m too mesmerised. I’m loving you getting your fashion inspiration from all the cool boys. It’s very outré. Love you coated pants – look hot! I like your look far better than Depp’s, honestly. Rockin’ blue hat! 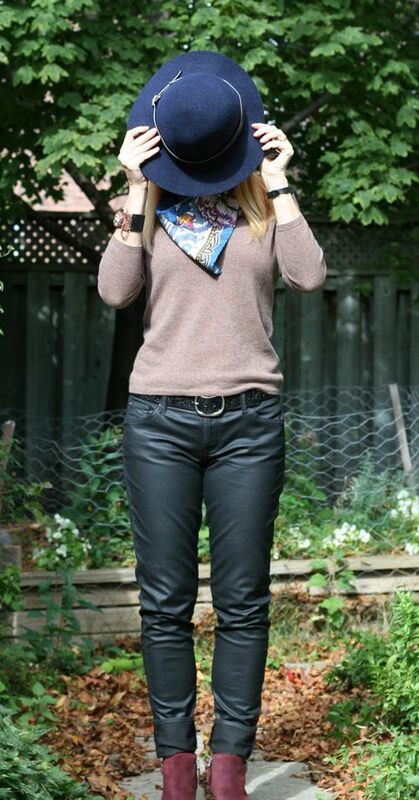 Love this and your certainly took the inspiration up a notch with the leather bottoms and those fabulous boots! i love the style inspiration! this is awesome! Ah johnny Depp–excellent piece of Man candy..
wait–you were wearing stuff in this post?? I got distracted…. Love your look. I need some fedora’s!! Hahahaha I just love the Johnny Depp advice 🙂 Perfection. Plus, this is an awesome outfit! I love how you kept the top and bottoms neutral and wore dark jewel tones on your head and feet and then let your scarf totally steal the show! Those are some HOT pants, girl. You wear them well. Love your Johnny-inspired look today. He’s so easy on the eyes. Actually I’m naked in this post…no matter. Keep lookin’ at Jonny. Thanks Jessi : ) You sums it up perfectly. Yeah…you know I’m not taking fashion advice from Gerard Depardieu LOL. I think the je ne sais quois is a perfect way to describe the hat and scarf look. There is just something about it that works so well! Oh, those coated jeans…and the burgundy boots…I’m having a serious case of bottom half envy. First Clooney and now Johnny Depp. You do know how to pick ’em. I’m really into hats right now, and this one is perfect. I’ve never seen a hat in such gorgeous color! 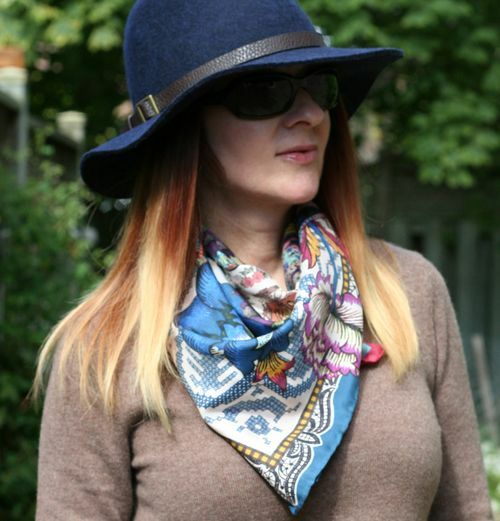 I think you made it work, and what is not to love about a great hat and paisley scarf. Another great male actor inspiration!! I love your hat! I don’t wear hat much but I do love how they add such a great dimension to an outfit. Yum! I’m kind of at a loss for words, but I am happy! Love your outfit, tip to toe! i’ve been loving all your boots lately!